Spolier: Base Colors & Inspection colors in order of unlock. Green Car Names: Has youtube video with complete scroll of all colors. Yellow Car Names: Has media but incomplete colors or doesn't scroll through colors in video. White Car Name: Just complete inspection colors in text form. Red Car Names: Massive holes in information. HELP ME ADD MORE CONTENT! Base Colors: Yellow, White, Dark Blue, Silver, Light Gray. Base Colors: Electric Blue, Red, White, Silver, Black. Base Colors: White, Electric Blue, Red, Gray, Black, Silver. Base Colors: Gunmetal, Blue, Red, Black, White, Silver. Base Colors: Black, White, Silver, Red, Blue. Base Colors: White, Silver, Black, Blue, Purple, Red. Base Colors: Silver / Gray, Red, Gray, Wine Red, Black, White. Base Colors: Tan/Brown, White, Silver, Red, Black, Gunmetal. Base Colors: Red, White, Black, Silver, Dark Blue. Base Colors: Yellow, Blue, Red, White, Silver, Black. Base Colors: Blue, Gray, White, Yellow, Red, Black. Base Colors: Wine Red, Gray, White, Black, Dark Blue, Black. Base Colors: Gray / Gray, Red / Gray, Black, Blue / Gray, Light Blue / Gray, Yellow/Gray. Base Colors: White, Black, Black, Red, Silver, Silver. Base Colors: Red, Yellow, Blue, White, Black. Base Colors: Black, Super White, Dark Red Mica, Green Mica, Metallic Blue. 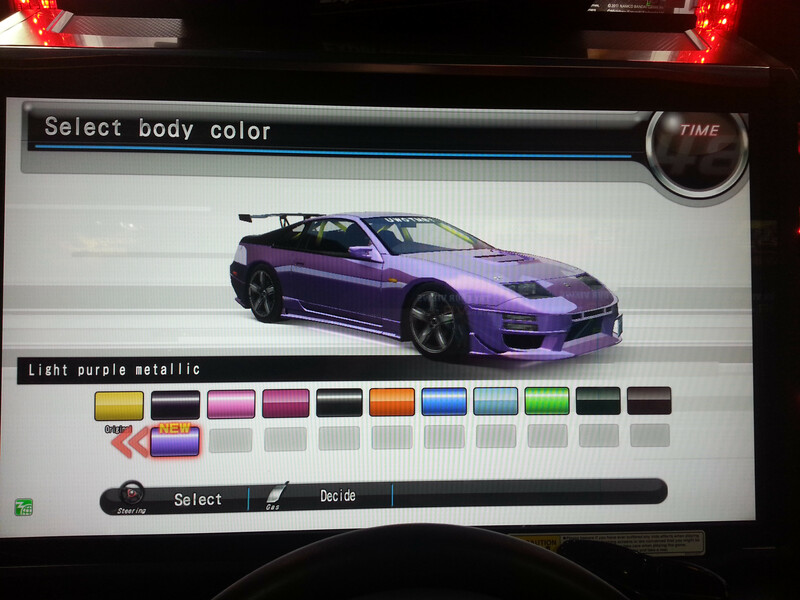 Base Colors: Metallic Silver, Super White, Black, Super Red, Super Bright Yellow, Blue Mica Metallic. Base Colors: Dark Green, Purple Black, White Pearl Mica, Silver, Metallic Galleria (wine red). Base Colors: Super White, Silver, Dark Blue, Dark Green Mica, Mica Red Wine. Base Colors: Silver, White, Black, Dark Red, Forest Green, Blue. Base Colors: Dark Blue, Silver, Maroon, Black, White, Beige. Base Colors: White, Silver, Aqua Light Green Metallic, Dark Green Mica, Metallic Dark Blue. Image size reduced, original size: 800 x 618. Click here to view the image in its original dimension. Base Colors: Red, Silver, White, Yellow. Base Colors: Dark Blue, White, Red, Black, Silver, Gunmetal. Base Colors: Midnight Purple, Dark Blue, Silver, White, Black, Red. Base Colors: Electric Blue, White, Silver, Black, Millennium Jade Metallic. Base Color: Red, Dark Blue, White, Silver, Black, Blue. Base Colors: Silver, Black, Dark Metal Gray, Red, White, Titanium Gray. Base Colors: Mettalic Orange, Silver, Red, Yellow, White, Blue. Base Colors: Silver / Black, Red / Black, Red, Silver. Base Colors: Red, White, Yellow, Silver, Black, Midnight Blue. Base Colors: Silver, Red, Copper, Blue, Black, White. Base Colors: Gunmetal, White, Yellow, Blue, Red, Black. Base Colors: Beige, Black, Gunmetal, Gray, Red, White. Base Colors: Yellow, Gray, Electric Blue, Red, White, Black. Base Colors: Yellow, White, Silver, Red, Black. Base Colors: Silver, Yellow, White, Red, Black. Base Colors: Lancer Blue, White, Silver, Blue, Black. Base Colors: Black, White, Red, Silver. Base Colors: Wine Red, Silver, Blue, Black, White. Base Colors: Red, Black, White, Silver, Dark Blue. Base Colors: Black, White, Beige, Silver, Red. Base Colors: Electric Blue, Red, Yellow, Silver, White, Black. Base Colors: Red, Silver, White, Dark Blue, Black. Base Colors: Yellow, Black, Red, Silver, Lime Green, White. Base Colors: Silver, Lime Green, White, Yellow, Black, Red. [spoiler]Base Colors: Red / Black, Silver / Maroon, Lime Green / Black, White / Black, Yellow / Black, Black / Gray. Ok just post the Link and I'll pop it in. OK added Thank you for the help! has anyone got the inspection colours for eight six? 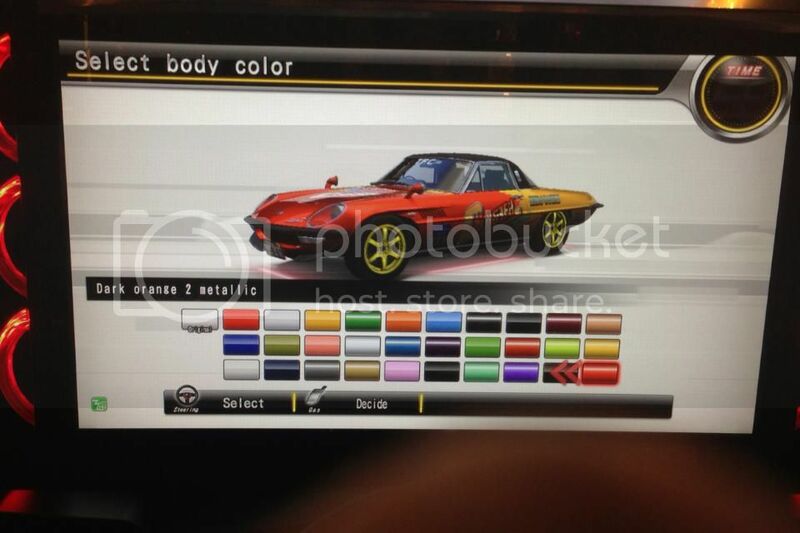 anybody has the inspection colors for the 2000GT? If anybody wants the coding for this post let me know. Since wmmt4/5 are never coming to NA I've given up caring. I'll get the inspection colours for the GC8 as I've almost unlocked them all. Thanks dare I saw on the Japanese wiki website that 110s has only six inspection colours available Does it mean that it has only six or is waiting for others for further information ? Image size reduced, original size: 960 x 543. Click here to view the image in its original dimension. Image size reduced, original size: 960 x 640. Click here to view the image in its original dimension. 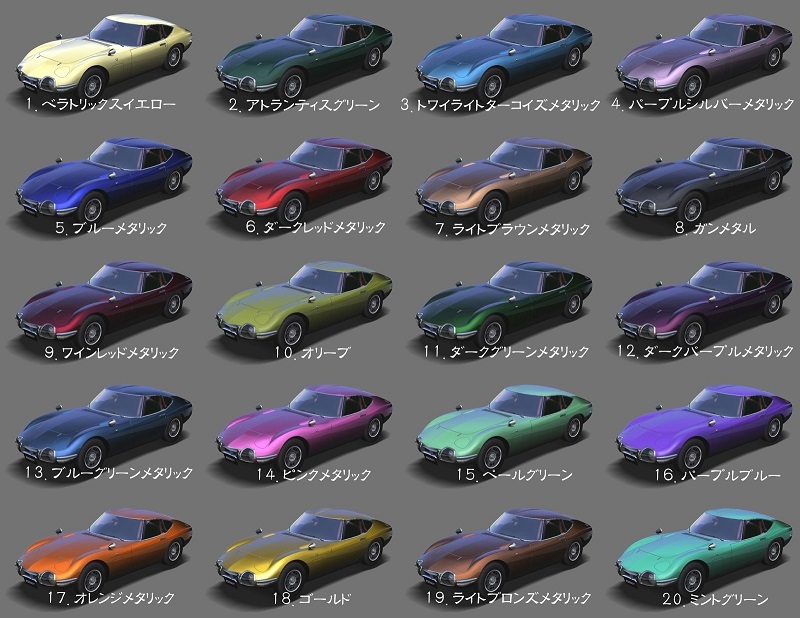 Anyone got the Celica Supra inspection colors in image and text? Would like to see even if it's only insufficient. Has anyone completed the Colors for the M3 CSL?